The post Remember When the Middleweight Division Was Compelling? appeared first on Caged Insider. Is Amanda Nunes One-and-Done With the Featherweight Division? Amanda Nunes, the queen of all female bantamweight fighters, moves up a division to fight the super-dominant champ Cris Cyborg. Nunes knocks her out in under a minute, takes the featherweight belt, and… says no mas to the whole 145-pound division thing. Yup. It looks like the new champ of female featherweights is eschewing defending her title. Instead, she’ll stick to the lower weight classes. This leaves poor Cyborg out in the cold with no rematch. And if (and when) Cyborg crushes whoever stands in her way of getting that championship back, there will still be a big question mark hanging over her head because of that quick loss to Nunes. Oh well. Maybe the UFC will sign PFL star Kayla Harrison. The post Is Amanda Nunes One-and-Done With the Featherweight Division? appeared first on Caged Insider. Midnight Mania! Did a Pair Of Tight Jeans Just Kill a UFC Division? Amanda Nunes doesn’t like being fluffy, evidently, as the UFC double champion is having trouble fitting into her wardrobe… but did she just kill the women’s featherweight division over it? UFC women’s featherweight was always a strange division. Rankings for it never really existed; it was created to showcase one woman: Cris Cyborg, the queen of 145. 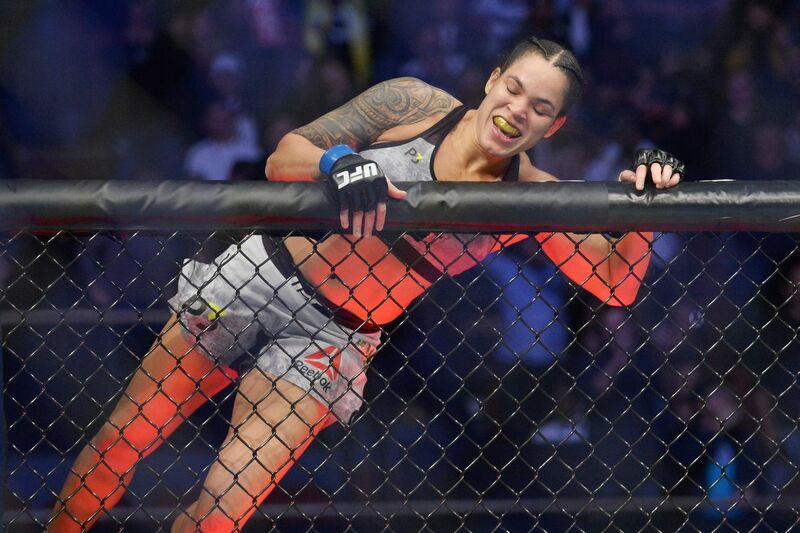 Amanda Nunes ended Cyborg’s 13-year reign in less than a minute. Afterwards, perhaps out of sheer pettiness, she said she plans on making Cyborg wait two years for a rematch, saying she wants to drop back to bantamweight and defend her belt in that weight class. Dana White also shot down Cyborg’s call for an immediate rematch. Cyborg, perhaps the only female fighter (possibly excepting Megan Anderson) on the roster who can’t make 135, has one fight on her contract… but only if the UFC offers her that fight before March. Once March comes and goes, she’s a free agent, with stated ambitions to try her hand at boxing. The UFC have shown they are willing to contemplate closing down whole weight classes, with the future of men’s flyweight currently unclear. With Nunes dragging her feet on any possible rematch, could this be the end of the UFC’s strangest division? The good news here? Nunes’ girlfriend, fellow UFC fighter Nina Ansaroff, says she still loves her. Will this scientific-looking approach to Dillashaw’s brutal weight cut work for him? According to him, the weight cut is over- the rest is academic. TJ Dillashaw is the most illustrious veteran of The Ultimate Fighter, ever. 1 of 10 TUF vets to win a UFC title. Only TUF Vet to be a 2x UFC Champ. Oleksandr Usyk could end up being the greatest heavyweight boxer of our time, and he’s not even a heavyweight. Amateur and professional MMA events have declined year over year in the United States since 2013, when the UFC really began to establish its stranglehold on the sport. That might not be the cause at all, but its definitely an interesting trend. Certainly some contraction on the US Regional Scene. On that note. the plaintiffs in the anti-trust lawsuit are claiming 99% of fighters were harmed because the UFC was able to pay them less than half of what they would have received in a competitive market. That seems about accurate judging by the effects of the Reebok deal alone. Plaintiffs say #UFC‘s scheme enabled it to pay fighters “less than half the amount they would have received in a more competitive market.” Also claim over 99% of UFC fighters we’re harmed. 10 total fighters not harmed. Not much new there, but hey, it’s something. Florida Man headlines, but with Mike Perry’s face, remain the best. Who do you wanna see Mike “Florida Man” Perry Fight next ? Yeah, this fight poster is pretty amazing. How being able to spar today made me feel. Why would Dillon Danis pick a fight with Jakie Shields, when Shields beat him in grappling? Happy Birthday to this belt collecting legend! The underground King @ealvarezfight!! Have a great day kid! And make room for that @onechampionship Belt! Cain Velasquez keeps trying to convince us that he’s really coming back. I’m not buying it yet. Derrick Lewis hasn’t gotten his free Popeyes for life ticket yet, even though its ten minutes from his house. A highlight of my buddy @samuelbark knocking guys out in Thailand & Australia . Sam is from Sweden having lived in Bangkok 3 years chasing the dream to one day be a future super star of the sport. Please give him a follow to keep up with his shenanigans . Just want to let everyone know, Sumo is back. Megan Anderson believes Amanda Nunes’ clinical KO victory over Cristiane Justino — better known as “Cris Cyborg” — is a positive sign for the future of the 145-pound division. Francis Ngannou went from being “The Next Big Thing” in the UFC to being labeled a bust in just a few short fights.